I chose to collect and complete this poesy of songs being reminded of the maze of days when they were born. Perhaps we are not lost, just taking a long time returning home. There are those who leave on journeys and those who are left behind. In whatever way separation manifests itself, it is comforting to remember the time spent with a loved one creating memories. This is another song I wrote during the same era as The Visit. Ancient peoples, be they the Norse or the Celts, instinctively knew their lives were closely interwoven with the company of trees. Not only did they provide and protect the necessities of life by way of air and water, they were also the habitat for other living creatures. The Hidden Life of Trees, by Peter Wohlleben, suggests that trees have a rich inner life of their own, while Ronald Wright’s A Short History of Progress, argues that the damage done to the earth’s forests may historically be one of our greatest sins. Not only have I always had a dog, I have spent much time marvelling at the special and unique relationships shared by many different species. This poem by W.B. Yeats, which I set to music somewhere in the late 1980s, seems to capture some of that special connection. In my earliest days of busking, this was one of the pieces I would perform during my 15-minute set. I gathered it in Winnipeg, Canada during my early years of connecting with Celtic music. Struck by the imagery of this poem, the longing and the mystery, I sought to put it to music in 2006 while working on An Ancient Muse. Turn towards the rising sun at the mountain, walk for five days and you will find the oasis by a big rock.’ Such were the directions of desert nomads. Or the songs lines of the indigenous people of Australia. The celestial and physical worlds have long provided the reference points for our navigation. Partially inspired by a Moldavian folk melody, this song is a tribute to that ancient knowledge. 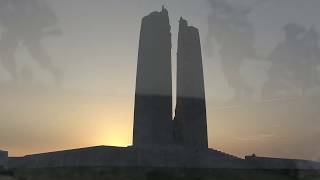 The inspiration for this piece came to me during a visit to the Canadian National Vimy Memorial in France while reflecting on all who had perished there. In this song, I am reminded that all families mourn the loss of their loved one, and that loss transcends borders, cultures and time itself. The soldier’s family mourns, the military ‘family’ mourns, and so does the community from which the soldier came.